http://madhattersteapartykaipara.wordpress.com/2012/10/27/a-great-tea-party-with-jonathan-larsen-and-ron-manderson/ goes on, standing for TRUTH and FREEDOM in between all the usual day to day stuff like finding a way to make a living in a mad world that doesn’t quite get wizards, philosophers or fantasy writers unless they are Tolkien or vampire creators. The latest practical development is a return to making concrete stuff – ferrocement gardens and anything else the patron imagines. 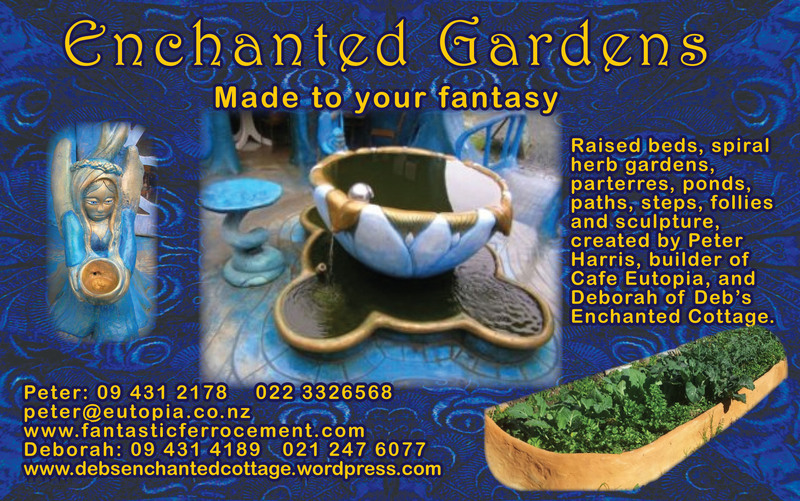 I met Deborah, my co-creator in this venture (who is mad keen on ferrocement and gardens too) because I had the Wizard sign out. So in a way it has been of pragmatic use to ‘come out’ as a wizard! Especially since she has a magical little ferro cottage/bach at the back of her place, built by a man named Weston, in need of renovation and containing a built-in water tank which under my sledgehammer is now becoming a sort of grotto of the goddess (the Chrysalis Cave). In this cottage she will sell all my eutopian objects, as well as her own. Magic is indeed unfolding there, and i am sure it will live up to its name ‘Deb’s Enchanted Cottage’.